I love that a tiny lentil can transform into something so magical. this lentil dish can be found on many Lebanese tables. Lebanese cuisine isn’t fussy, stuffy or lavish. Many dishes aren’t particularly technical to make. Overall, most of the meals are what we could call, peasant meals. Meals that cost merely pennies to make but fulfilling enough for a large family and to stretch your budget. My family wasn’t rich growing up, my mom used to stretch our food budget to make the most of it, yet we never were deprived of type of food. Everything she made for us was comforting and nourishing and included a variety of meats, grains and vegetables. I appreciate now what I grew up with, the comforting meals, the simpleness of it all. I can’t remember if I particularly liked Mujadara as a kid but the fact that my kids adore it is enough for me to make it again and again and relive my childhood. 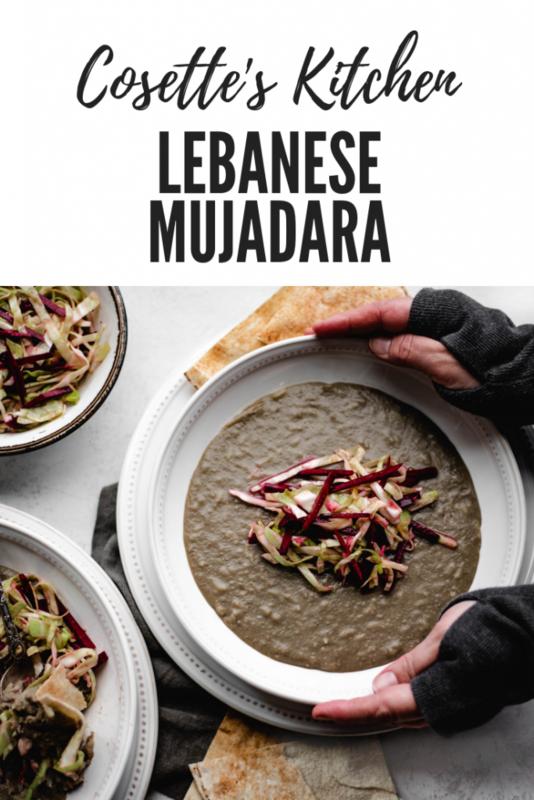 Most of the Mujadara you’ve seen will include the whole lentil, large grains of rice mixed in and the sacred caramelized onions on top. This version is a bit different, one extra step of taking our cherished lentils and actually extracting everything out of each bean then gently cook the filling with a little bit of rice. The result is a smooth, porridge-like dish. Enjoyed with pita bread and a salad with garlic and lemon dressing it is simple enough for Meatless Monday or to serve to guests. I think the hardest part of this recipe is making sure you own a food mill, yup, a food mill! I know it’s another gadget but I promise you it is well worth it to make Mujadara and not to mention the BEST mashed potatoes EVER! You can also use it to seed fruit, make jams and more. So it’s worth it, I’ve linked it above for you, I prefer the plastic body over the metal. This is what the lentils, water and onions look like after cooked down. From there, it’s all about boiling some beans and rice, pretty simple. Great to make in the morning and have ready for dinner or even over the weekend. It’s actually best served room temperature which makes it awesome to make ahead! 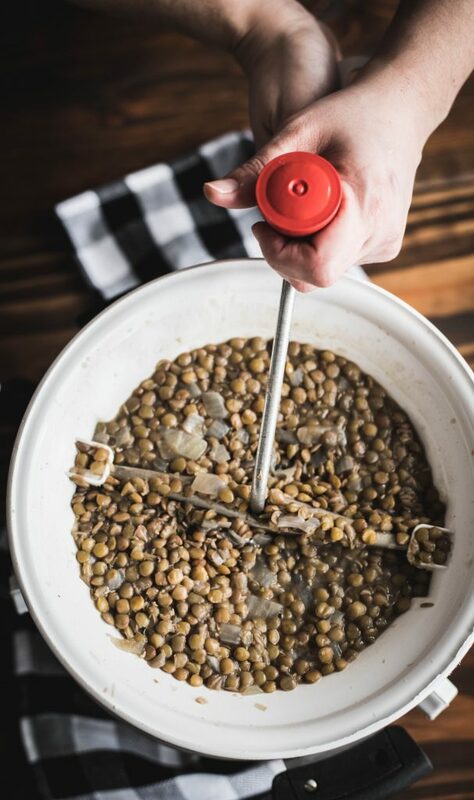 You’ll simmer the lentils until they are soft and tender, next, using your food mill pour the lentils and water mixture through and begin to work through the small-holed disk. The lentil water mixture will come through the bottom (be sure to have a pot underneath). After all your lentils have been extracted, bring your pot of lentil “broth” back to the stove. Add in your rice and cook gently until the rice softens and the mixture thickens slightly. That’s it! Salt to taste and pour into your dishes, dinner is served. 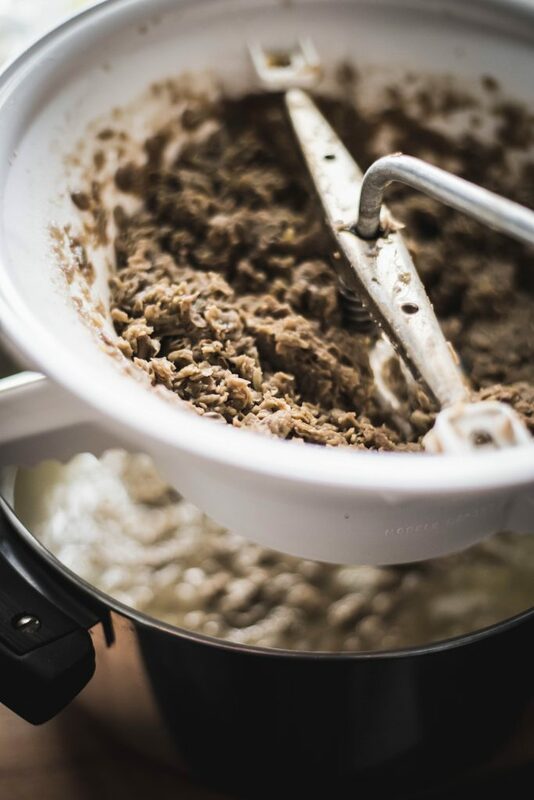 Simply pour the lentil mixture in the top of the food mill and begin swirling and swirling until you are left with the lentil skins. You can see the lentil skins in the top and down below the lentil puree. I truly hope you try this delicious and simple meal. As always, I love seeing your creations, tag me on Instagram or Facebook!! Don’t forget to Pin the recipe! 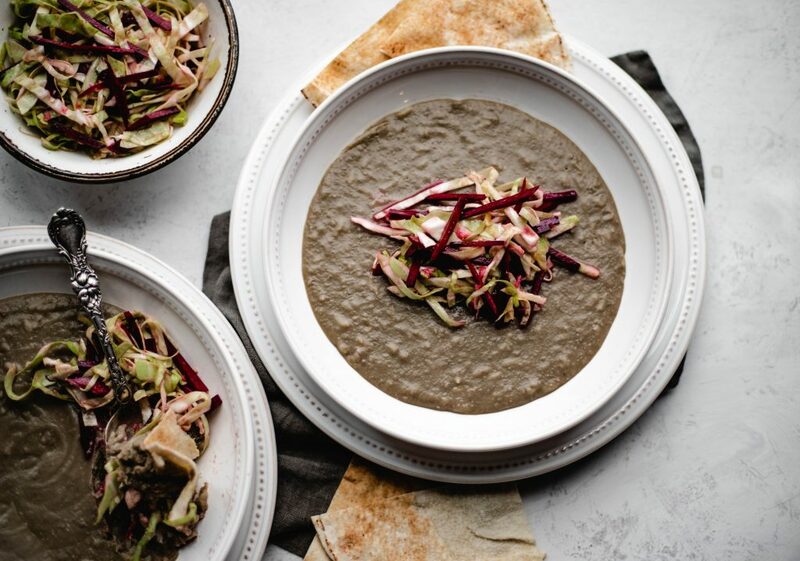 A simple lentil porridge dish that will surely satisfy. 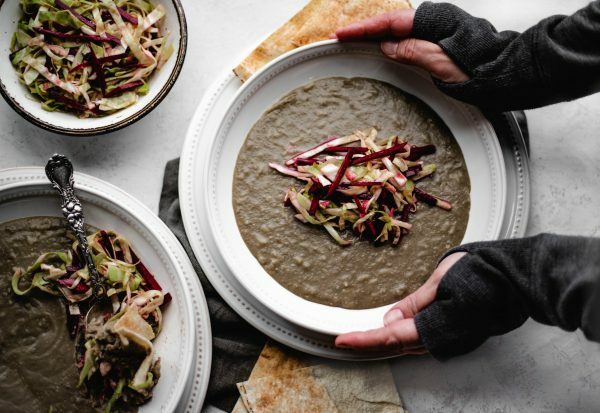 Gluten-free and vegan, it's a wonderful meal to serve. In a large heavy-bottomed pot, add your oil and saute your chopped onions on medium heat. Once onions become translucent, add in your dried lentils and add enough water to cover the lentils by about 2-3 inches. Place pot back on stove and let lentils come to a gentle boil, lower heat to medium-low and continue cooking until lentils are tender. Usually about 30-45 minutes. 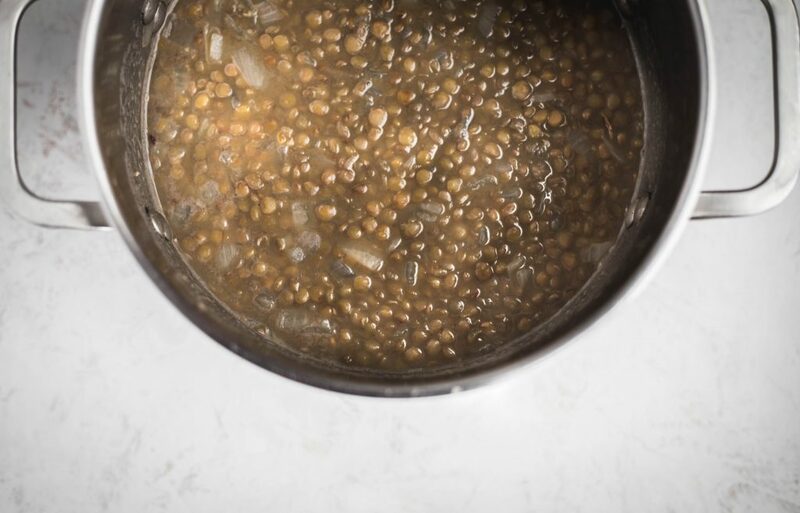 If you need, you can always add more water to the pot if your lentils need more cooking time or begin to lose their water before they are tender enough. 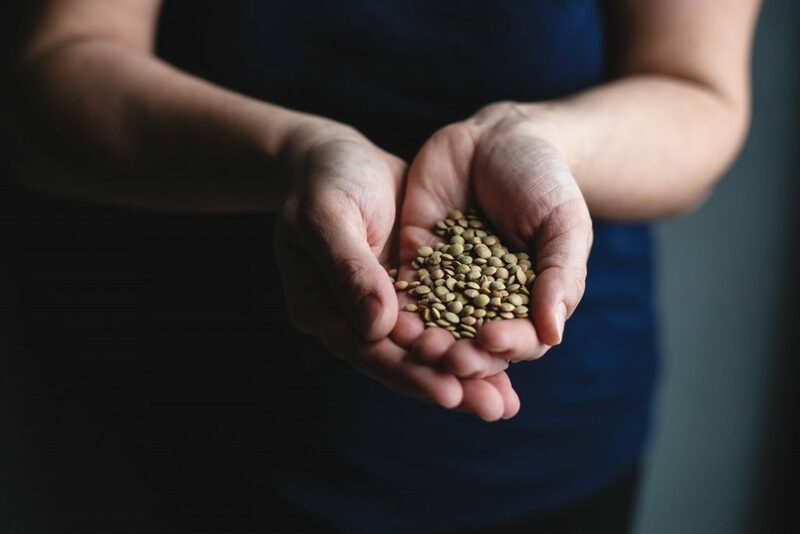 Once your lentils are soft and tender, remove the pot from the stove and prepare your food mill. Use the disk with the smaller holes on your food mill and place the mill on top of another pot ( I usually work at the sink for this). Next, pour your water/lentil mixture in the food mill a cup or two at a time. Mill the lentils until the bean are extracted and you're left with the skin. Add in more of the mixture (on top of the skins) and continue until the pot is done. Place the lentil "soup" back on the stove and add in your rice, set to medium-low and keep a wooden spoon in the pot. Be sure to stir often so your rice and lentils don't stick to the bottom. Continue stirring often and watching your mixture as it begins to slightly thicken. You'll want to cook until the rice is tender, usually 20-30 minutes. I check by taking one grain of rice out and testing. Once your rice is tender, salt to taste, usually 1.5 tsp of kosher salt or so. Pour your Mujadara into shallow bowls, I like to do some smaller individual-sized ones and one or two larger ones. Leave on your counter to cool and enjoy when they are room temperature. We like to serve with cabbage slaw, mix cabbage and raw beet slices with olive oil, garlic, lemon juice and salt to create a simple dressed. The tangy flavor is delicious with the dish and cabbage and beets stay nice and crisp, perfect compliment to the dish.